LPHS hosted its very own Student vs Staff game to raise money for Riley Children’s Hospital on March 15th. After Student Council spent an afternoon brainstorming ideas, the concept of student vs staff seemed like the perfect way to merge friendly competition and a way to raise money. From selling shirts and tickets all week prior, over $5,000 in donations was raised for Riley Children’s Hospital. Kesling Student Council was also a part of the fun, holding its own Student vs. Staff game prior to the high school. “To me, the best thing ever was walking into the packed gym and knowing that everybody there stepped up to support a great cause. Being able to cut a check for over $5000 is so rewarding knowing that it is going to such a beautiful cause!” Mrs. Dawson, LPHS Student Council co-sponsor, said. 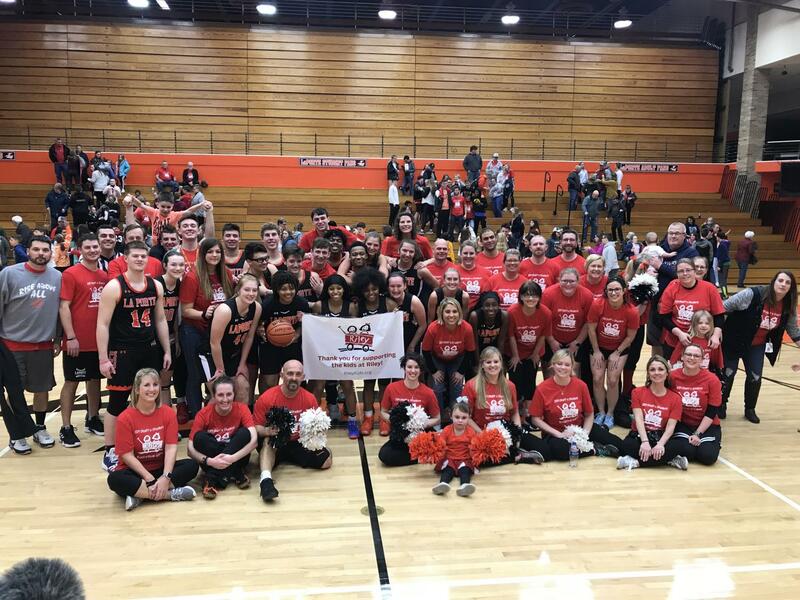 The Slicer girls and boys’ basketball teams competed against some of the LPHS staff and administrators. LPHS faculty even put together a cheer squad to help hype up the crowd. Some of the highlights from the game included the teachers “Top Secret” strategy in order to defeat the students including Mr. Kuzdas running onto the court in a blonde wig to help score a basket and all the female teachers taking the court at once to try and stop the talented girls squad. “It is always a great opportunity to give back to a worthy cause, such as Riley Hospital. It was fun to go against our girls basketball team and to compete with our staff. I hope we continue this same event in the future,” Mrs. Wireman, assistant principal, said. The event would not have been possible without the planning and hard work of senior Council member Tiffany Lin. “Being in charge of an event that was able to be this successful and raise this much money for Riley Children’s Hospital has been one of the proudest moments of my life! I always try to give back and help when I can, and I love that I was able to be a part of something that will hopefully change some lives,” Lin said. It was a night all will remember because of the fun and the altruistic outcome. “I wanted to play because it would be a fun experience to be able to play with some of my teammates again. Also, it was for a great cause, and we were able to raise a lot of money for it,” Riley Ott, senior, said.